Politicians and campaigns that once could reach the vast majority of voters with a mix of TV, mail and radio increasingly confront a fragmented media landscape that requires more specialists, even for races far down the ballot, said Issenberg, a fellow at UCLA’s Center for Civil Society. “People are clearly spending more money on campaigns,” he said. Some campaign businesses did particularly well during the 2013 and 2014 cycle, state filings show, with net earnings from California campaigns running well into the seven figures, according to state reports. Roseville-based Redwood Pacific Public Affairs, and its sister media-buying company GCW Media Services, were the biggest earners in California, netting about $6.2 million, according to campaign filings. Their main clients were the campaign to defeat Proposition 45, a measure that would have given the state insurance commissioner veto power over health rates had it passed; and Republican gubernatorial candidate Neel Kashkari. Richard Temple of McNally Temple Associates Inc., a large Sacramento consulting firm, said last year’s political landscape was friendlier than usual for Republican candidates. The party out of the White House traditionally does well in midterm elections, and California’s November ballot lacked any competitive statewide races to spur higher turnout, something that usually benefits Democrats. Temple’s firm, which handled Republican activist Charles Munger Jr.’s Spirit of Democracy outside spending committee, netted $1.8 million, state filings show. “In 2014, donors and the political leaders recognized that there were opportunities. Those opportunities don’t come around often, and they did last year,” Temple said. Of the more than 800 campaign payees that received at least $50,000 in 2013 and 2014, more than a third of the money went to recipients in and around Sacramento. 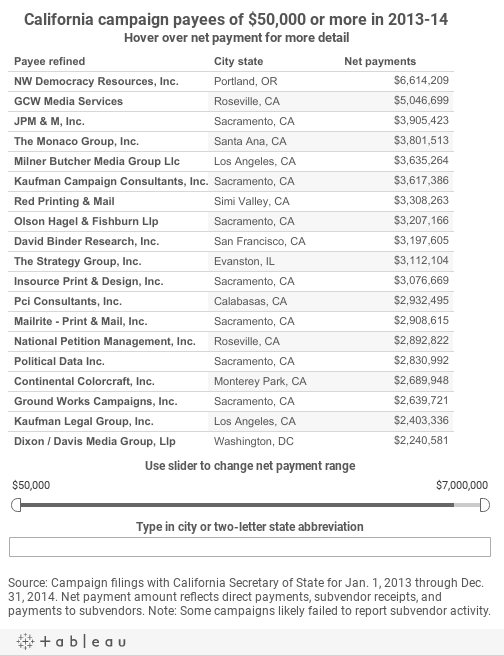 The Sacramento-based Republican firm GOCO Consultants netted about $2 million in 2013-14, among the most in the state. Veteran GOP operative Jimmy Camp – the C in the firm’s name – said the company had a great cycle and credited it to the state party’s improved finances. State campaign committees reported paying Democratic consulting firm JPM&M Inc. a net of $3.9 million during the last cycle. Among other efforts, the firm worked for the No on 45 campaign, as well as for the opponents of Proposition 46, which would have lifted the pain-and-suffering cap on medical malpractice claims. “We’ve been really fortunate we’ve done as well as we’ve done,” the firm’s Josh Pulliam said, adding that its goal is to elect good people and improve the state. Besides the spending on state races, hundreds of California-based companies received direct payments of $187 million from federal campaign committees in 2013 and 2014, records show. Unlike the state, federal committees do not disclose subvendor payments, so it’s impossible to get a full picture of where federal campaigns spent their money. The secretary of state reports underscore the extent to which, several years after Barack Obama’s presidential campaign broke new ground in using technology to target voters, California campaigns increasingly make use of high-tech tools. Temple, the Republican consultant, said two things are behind the shift. One is a steady drop in the number of people watching TV, listening to radio or reading campaign mail, which are traditional methods of communicating with voters. At the same time, he said, technology now allows campaigns to target specific voters with specific online ads, rather than just putting a banner ad on Facebook. “It’s like sticking a sign on someone’s front door as they walk in the house,” Temple said. The reports also highlight the extent to which the state’s political business, which traditionally has broken down along ideological lines, has evolved in an era of high-spending outside groups and runoffs between members of the same party. In some cases, Republican consultants worked for independent groups that favored a Democratic candidate, or Democratic firms worked for outside groups involved in Republican vs. Republican contests. Some union-allied firms worked for outside committees mostly bankrolled by business, while companies specializing in environmental causes in some cases signed on with groups that received funding from oil interests. The firm of Democratic political consultant Gale Kaufman received $3.6 million from state campaigns in 2013-14, records show, and advised the No on 46 campaign as well as Democrat Tim Sbranti in a bitter East Bay Assembly race that attracted several million dollars in outside spending. Other Democrat-aligned firms worked for outside committees that criticized Sbranti or backed union-opposed Steve Glazer during the primary.